The Chic offers first floor living at its finest with an open concept kitchen with direct site lines into your dining and living spaces. This floor plan is perfect for entertaining with brand new stainless steel appliances, new white kitchen cabinets, granite style counter tops and wood-style flooring throughout. This lovely one bedroom also comes complete with a washer and dryer. Our Posh floor plan offers first floor living with an open concept kitchen with a spacious breakfast bar. 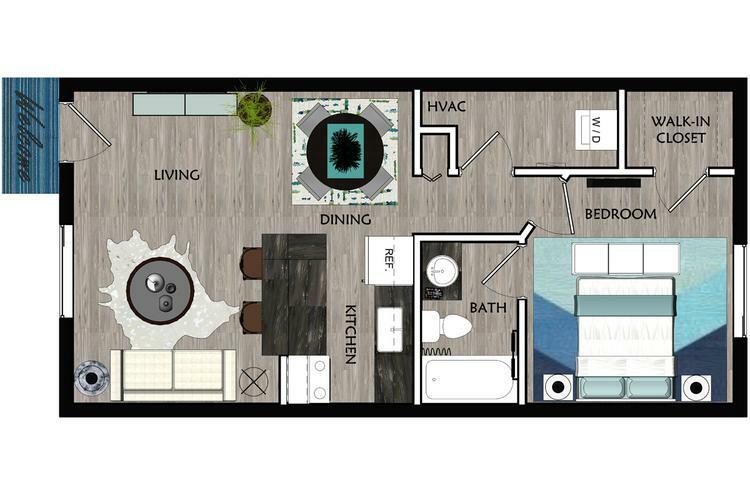 This floor plan is perfect for entertaining your guests with its open site lines into your dining and living room. The kitchen features brand new stainless steel appliances, new white cabinets, granite style counter tops and wood-style flooring throughout. This lovely one bedroom also comes complete with a washer and dryer.